A big article from Bloomberg claiming that certain custom manufactured models of Super Micro servers shipped with hardware implants of a company (Elemental) that was offering services to US Security agencies. This company was later sold to Amazon and sold services to a company later acquired by Apple for the Siri voice product. Bloomberg published a feature article with custom formatting that shows it believes it has a scoop and high profile story to create traffic (and profits). Read the article and then I’ll throw up my thoughts on the issue. These are not the usual mealy mouthed legally safe media responses. These are outright and unequivocal rejections of the entire Bloomberg article and its assertions. Such assertions against a major press outlet with substantial financial clout itself and also control of the financial news flows is unusual. I’m very dubious that report is accurate and most likely the interpretation is poor. Proving facts in IT Security is really hard and attribution is rarely possible. Overall the story feels contrived, its just too convenient to be exactly true, yet, some of the information feels that it has to be true. HOWEVER, the ‘investigation’ ran for more than a year and has 17 unnamed sources. Bloomberg is a publication of record and say that the investigation has been running for more than a year. If the accusations are false then Bloomberg will lose serious credibility. Its possible and viable to compromise the server BMC with an implant but activating and exploiting would be impractical. The impact to Enterprise IT ? It could drive more companies to the cloud companies who have much greater control and ability to secure their supply chains than traditional IT vendors. Its most likely that vulnerabilities in the Baseboard Management Controller (BMC) used to perform lights-out operations on the server hardware. Standards are loosely based on IPMI and Redfish which do not specify much about security. You might know BMC by their proprietary implementation names : HPE ILO, Cisco’s IMC, Dell DRAC. The BMC chips control the server from power on via a number of internal buses and has almost full control of all the critical systems including Boot ROMs, USB, Storage etc. These vendors that make these have a long history of sub-standard security in the web servers on the OOB controllers. There are dozens (hundreds?) of known vulnerabilities from simple web server exploits. The most likely method would be a modified boot rom on the BMC that is read at startup. This prevents the code from being removed for updates. Because the BMC has unrestricted control of the buses between chips and full privileges, there is little that can not be be dome. Activation: How do these implants get activated ? It would be poor tradecraft to attempt to ‘phone home’ as this is highly probability to be detected. Its more likely they are activated out of band such as a magic string to the BMC Ethernet interface which assumes that you have access to the management network. Realistically this would require inside contact as these networks are tightly controlled and restricted to minimum users. You could take a more extreme view is that there is unknown vulnerability app/VM that could reach into the server hardware and activate the implant but this access via I2C bus is highly unlikely unless other modifications were performed. (This is possible given that hardware implant has been done already and further implants may be possible). Hardware attacks like this leave proof/evidence. Attribution is hard. It could be China national security apparatus performing these activities. It could be the NSA building access to have a foot print for future programs. It could be inside job – employees could be compromised by a criminal or security organisation to perform the work. SuperMicro execs may not know or, at least, can be convinced turn a blind eye to implant activity. As long as the products are being sold & profits made who cares too much about the implants. Can We Manage Supply Chain Attacks ? Bruce Schneir : Supply-chain security is an insurmountably hard problem. Our IT industry is inexorably international, and anyone involved in the process can subvert the security of the end product. No one wants to even think about a US-only anything; prices would multiply many times over. Supermicro is a US registered company operating in San Jose, California but products assembled in China. As Bloombergs highlights, a substantial amount of internal work is done in Mandarin because thats where the work is done. Political tensions including the trade disputes make this a fraught issue to engage with. However, the publishing of this story at this specific time is worth considering in the light of political tensions. It could be a smear campaign by US agencies to promote a political agenda. We have no comment from US spy agencies yet but have a record of compromising the supply chain as we saw with Cisco routers when Snowden released documents. The Enterprise IT question ? How can Dell/Cisco/HPE guarantee that their products are free from hardware hacks like this ? Each vendor outsources at least some of hardware design to third parties in India (mostly) and China/Hong Kong. Most silicon comes from the US or Taiwan, some from Japan. Assembly and packaging is almost exclusively done in China where labour and factories are available (and cheap). Note: Apple will prevent the use of OEM repair components in latest generation of MacBooks and could be a response to supply chain vulnerabilities. A new module requires a program to validate the components. While this restricts the ability to repair to your it also provides validation that the hardware has not been compromised. Best situational summary on this subject I have seen thus far. 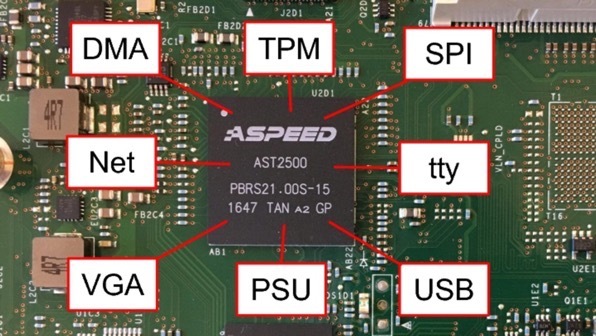 I wonder at why I have yet to see a true picture of the board with a red circle around the “spychip” for all to see and investigate. Surly numerous security firms would look hard at it and we would have collaboration.. or not. The boards are out there, and can’t be retracted, like a smoking gun in the middle of the room. Without addressing physical (literally tangible) facts this reeks of bearing false witness. I was an avid Bloomberg watcher/listener before this sloppy report. Institutions carrying and repeating this story are largely financial news outlets. I am having the suspicion that Washington has found a lever to weaponize financial news. This a Washington that has recently shed any qualm it might ever have had regarding obvious facts and “truth”. It has a Trumpy smell. Yet why has no one stood on a podium with board in hand and said “where is this chip?” This is big news, why are we not getting to the bottom of it faster? I agree with Jerry, very good article. Thanks for the read and analysis.